Dr. Ahmad N Azari, MD is a Doctor primarily located in Germantown, TN, with other offices in Memphis, TN and Memphis, TN (and 1 other location). He has 25 years of experience. His specialties include Obstetrics and Gynecology. He speaks English. Dr. Azari has received 4 awards. The overall average patient rating of Dr. Ahmad N Azari is Excellent. Dr. Ahmad N Azari has been rated by 120 patients. From those 120 patients 10 of those left a comment along with their rating. The overall rating for Dr. Ahmad N Azari is 4.7 of 5.0 stars. Dr Azari performed the removal of a fibroid I had this is day 3 and I am up and doing my normal activities.He is professional,wonderful, direct and he helps you understand what is going on.He is the best ever!!! Dr. Azari is the best. I have been a patient of his for 5+ years and would recommend him to anyone. He always takes the time to explain everything and always answers all of my questions. I love Dr Azari I have been a patient of his for over 5 years now,and I follow him wherever he goes. .He's the best! Dr. Azari is excellent!!!! I could not have found any one better. 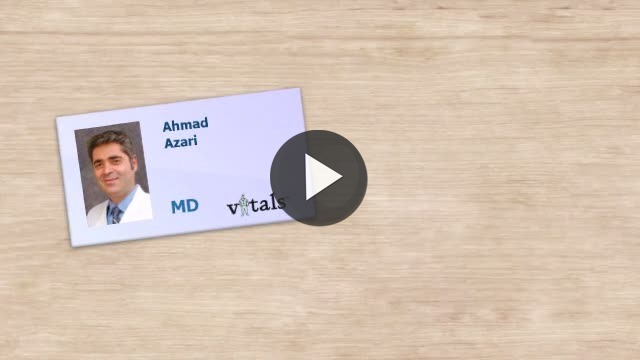 Take a minute to learn about Dr. Ahmad N Azari, MD - Obstetrics and Gynecology in Germantown, TN, in this video. Dr. Ahmad N Azari is similar to the following 4 Doctors near Germantown, TN. Have you had a recent visit with Dr. Ahmad N Azari? Select a star to let us know how it was.